Find here detailed information for participating in a team in Italy, in the north-western Mediterranean, leaving from Sanremo. Be part of the research project: volunteers are a valuable support in the fieldwork. Research is conducted aboard the 21-mt motorsailer “Pelagos“, in the Ligurian Sea from May to September, departures each monday from Sanremo (Italy). The participants’ contribution not only represents the main funding source for the research; volunteers are also a valuable support to the researchers and they are expected to help in all aspects of the fieldwork, noting that they are not just whale watching but that they are part of a scientific project. With the Cetacean Sanctuary Research (CSR) Project works a highly qualified international team. Each cruise has one experienced Principal Investigator, one or more further researchers, and one assistant or student. Life on board and the daily schedule may vary on the basis of sea state, weather conditions and research priorities. 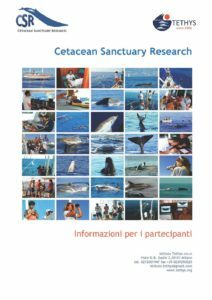 Please find here all necessary information for booking and paying an expedition with the Cetacean Sanctuary Research project. When you place your order and pay for your cruise you will receive an email with the links needed for downloading the booking forms. The forms must be filled and signed and sent back to the Tethys office via email (tethys@tethys.org) or via fax (+39 02 39 29 05 25). The booking forms are also downloadable here. Refunding 20% of the participation fee is non-refundable. In case of cancellation a written notification must be sent to Tethys not less than 30 days in advance, in order to be entitled to a reimbursement of 80% of the entire participation fee. Cancellation 1) for those expeditions not reaching the minimum number of 5 participants, the Tethys Research Institute will reserve the right to cancel that expedition team (at least 10 days before its scheduled start); in this event the applicants affected will be fully reimbursed; 2) in case of a cancellation originating from any technical/logistical problem attributed to the Tethys Research Institute, the organisation will reimburse the applicants with the full amount of the participation fee (no additional reimbursements are foreseen) or, upon request, will try to place applicants in other expedition teams, depending on availability. Any application for a university student discount (for students under 26 years ) will require a copy of the valid student ID which must be sent via fax or email when providing your booking form fully signed.